Imagica - a name which everyone is very familiar in every household, is an amusement park located near Khopoli. 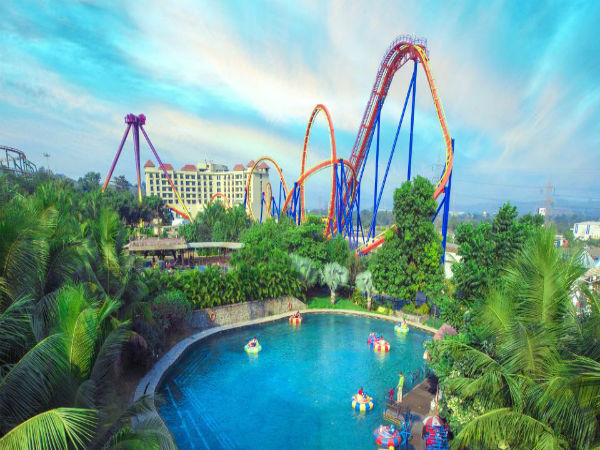 Imagica began its operations in the year 2013, since then it has never disappointed a visitor. Since its opening, the amusement park has always been one of the most popular weekend holidays for every individual irrespective of their age groups. The park attracts the young and old equally, who enjoy their stay to the fullest in the wacky waves, gold rush and the high thrill rides. One of the best ways to reach Imagica is by road. The town is well-connected by roads and there are regular buses that operate from Mumbai and Pune, to the park. Those who want to opt for Route 1, it would take you approximately around 1 h 20 mins to reach Imagica, via Bangalore - Pune Highway. The route takes you through the well-known towns of Navi Mumbai, Rasayani etc. The roads are well-maintained, which helps one to cover the distance at a good pace and the distance is about 68 km through this route. Rasyani can be considered as stopover through this route. The place is well known for the ancient temple of Raseshwar which is dedicated to Lord Shiva, the place gets its name from the deity. The ancient river of Patalaganga flows through this town in small streams which prople consider it as holy. If you opt for Route 2, it would take you approximately 2 h to cover a total distance of 70 km from Mumbai to Imagica, via Mumbai - Pune Highway. On Route 3, it would take you around 2 h 10 mins to cover the distance of 90 km, via Mumbai- Pune Highway to reach Imagica. The 300 acre amusement park is owned by Adlabs Entertainment Ltd. The park receives an estimated footfall of 15,000 visitors everyday, and more on holidays and weekends. Till date the park has hosited over 3.5 Million visitors. The entire complex has three parks in it - the theme park, the water park and the snow park. They have different rides for different age groups. Guests can bump into the in-house characters of Tubbby - The Elephant, Roberto - The Star Chef, The Lost Astronaut, Mogambo of Mr. India fame and The Gingerbread Man while hopping from one ride to another. The Snow Park here is one of its kind in the country, which is spread across an area of 15,000 sq ft, making it one of India's largest snow parks. The snow park has an artificial snowfall machine, which they start ten minutes after people have entered the park. This gives the real feel of a snowfall. The snow gets collected on the floor and people can play with it. The Theme Park has quite a number of rides in store for the guests such as Nitro, Scream Machine, Salimgarh etc. Nitro is a roller coaster, which reaches a maximum height of 132 ft and a maximum speed of 65.2 miles per hour. The Scream Machine is another major attraction here, the ride is a rotating swivel which rises to steep angles of 120 degrees and achieves a height of 148 ft above ground level. The Theme Park is open everday from 11:00 am To 7:00 pm, The Snow Park operates from 10:00 am To 7:00 pm and the Water Park functions from 11:00 am To 6:00 pm.